Tuesday, Nov. 3, 2009 at 11:37 p.m. Throughout the 2009 gubernatorial election, New Jersey voters have consistently said that they would like to hear the candidates talk more about property taxes. Chris Daggett briefly surged in the polls after he laid out a plan to reduce property taxes. While they may not have been satisfied with how well the candidates addressed this issue in the campaign, the exit polls asked voters who they felt has the best plan to lower this tax burden. In the end, it seemed not to matter all that much to the outcome. About 4-in-10 (39%) voters said that none of the candidates offered a good plan. 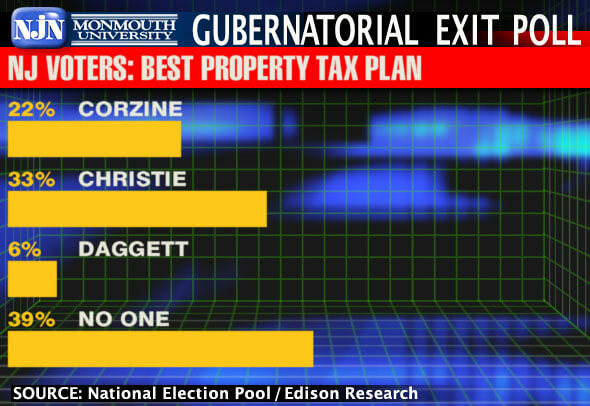 Among those who make a choice, Chris Christie is the nominal winner, with 33% saying he has the best property tax plan, compared to 22% for Jon Corzine and just 6% for Chris Daggett. Among New Jerseyans who considered property taxes to be the most important issue consideration in their vote today, 45% felt Christie had the best plan, 14% gave the nod to Corzine, 9% said Daggett, and 32% felt none of them did. Ironically, incumbent Democrat Jon Corzine fared well among those who felt that none of the candidates adequately addressed the state’s number one issue. Among those who felt that none of the candidates came up with a decent property tax plan, 52% decided to vote for Corzine, while 39% went for Christie. “It seems that Christie’s decision to avoid discussing a specific property tax plan did not deliver a fatal blow to his candidacy and may have even worked to his advantage,” said Patrick Murray, director of the Monmouth University Polling Institute and exit polling analyst for NJN News and Gannett New Jersey.